Ptosis means downward displacement of an organ or tissue structure. Ptosis in ophthalmology usually refers to a drooping upper eyelid (blepharoptosis) but it can also refer to a drooping of the eyebrow (brow ptosis) or the midface (midface ptosis). Blepharoptosis may affect one or both eyelids and can be very asymmetrical depending on the underlying cause. A brow ptosis and a blepharoptosis may co-exist. For information about brow ptosis click here. It is important to see a specialist oculoplastic surgeon to determine the underlying cause of a blepharoptosis e.g. 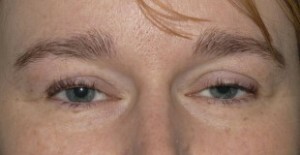 a Horner’s syndrome, and to ensure that there are no associated eye problems before proceeding with any eyelid surgery. 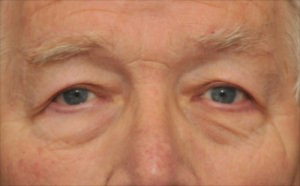 It is often overlooked that a blepharoptosis can also be caused by botulinum toxin injections (Botox or Azzalure injections) given to improve frown and laughter lines. The most common type of acquired blepharoptosis, usually seen in adults, is caused by a stretching and thinning of the tendon of the muscle that raises the eyelid. (This muscle is the levator muscle – its tendon is referred to as the levator aponeurosis). 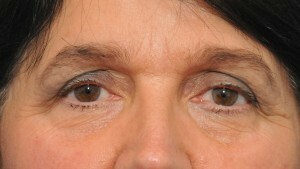 This can occur as a result of ageing, after eye surgery e.g. glaucoma surgery, long term contact lens wear (particularly with hard or gas permeable contact lenses), or following an injury. This is referred to as an aponeurotic blepharoptosis. Other causes include Horner’s syndrome, eyelid or orbital lumps, or rare muscular conditions e.g. myotonic dystrophy, myasthenia or chronic progressive external ophthalmoplegia. Click here to listen to this patient describing her experience of undergoing droopy upper lid surgery (a posterior approach Muller’s muscle resection) under “twilight Anaesthesia”. This is far preferable to general anaesthesia for the vast majority of adult patients. 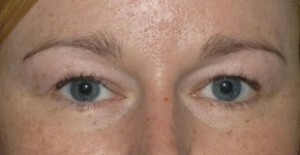 A photograph of the same patient following a levator aponeurosis advancement. She was also fitted with a cosmetic contact lens at Eye2C Optometry to camouflage the appearance of her blind eye and traumatic cataract caused by her injury. What are the signs and symptoms of adult blepharoptosis? 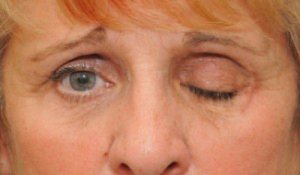 A drooping eyelid is the primary sign of blepharoptosis. There may be some vision loss in the upper field of vision. There may be fatigue from attempting to elevate the lid or there may be a marked compensatory elevation of the eyebrows which act as a secondary elevator of the eyelids. 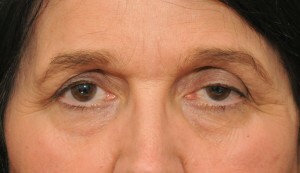 Droopy eyelids can also have a profound effect on a person’s cosmetic appearance and self-esteem. How is adult blepharoptosis treated? The treatment is usually surgery although there are a few very rare disorders that may be treated medically (e.g. myasthenia). During surgery the levator tendon (the levator aponeurosis) may be tightened, usually under local anaesthesia with intravenous sedation provided by an anaesthetist (“twilight anaesthesia”). This is referred to as a “levator aponeurosis advancement.” For smaller degrees of blepharoptosis, an alternative “scarless” operation can often be performed via an incision on the inside of the eyelid. 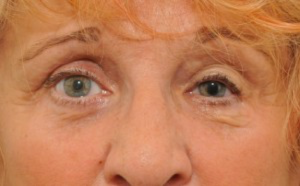 This is referred to as a posterior approach “Müller’s muscle resection.” This is a very commonly performed operation in our practice and allows a degree of postoperative adjustment of the height and contour of the eyelid. Very rarely the lids may be attached to the brow so that the forehead muscles do the lifting. This is required for patients who have very poor movement of the eyelid(s). This is referred to as a “brow or frontalis suspension procedure.” The eyelids may be suspended using synthetic material e.g. a nylon suture (polypropylene), a silicone band, or tissue taken from the outer aspect of the thigh (fascia lata) through a small incision just above the knee. An ophthalmic consultation can provide a comprehensive assessment of your blepharoptosis, and a discussion of the best treatment option for you. Blepharoptosis surgery can be combined with an upper lid blepharoplasty (eyelid lift, eye lift, or cosmetic eyelid surgery), or this can be undertaken at a later date if necessary. It is very helpful if you have old photographs which you can bring along to the consultation. Mr Leatherbarrow examining a patient using a slit lamp. You may have your blood pressure checked by the nurses. Please answer all questions completely and honestly as they are asked only for your own well-being, so that your surgery can be planned as carefully as possible. The information is treated confidentially. If you are unsure of the names of any medications, bring them with you. You will be told whether or not to stop any medications at this preoperative clinic visit. For example, if you are taking aspirin-containing medicines or anticoagulants (e.g. Warfarin or Rivaroxaban) they may need to be temporarily withdrawn or reduced in dose for two weeks before the procedure as long as these are not medically essential. You might need to check this with your GP. Any anti-inflammatory medicines e.g. Ibuprofen, Nurofen must be discontinued at least 2 weeks before surgery. These medicines predispose you to excessive bleeding. You will be given a leaflet advising you on what medications, foods, and vitamin supplements to avoid prior to surgery. Your blood pressure should also be under good control if you take medications for hypertension. This is very important. The rest of your face is then examined. Photographs of your face and eyelids are taken before surgery so that the results of surgery can be compared with the original appearance. The photographs are confidential and can only be used for any purpose other than your own records with your specific permission. We much prefer that our patients return to see us in clinic before proceeding with their surgery so that we can have the opportunity to answer any queries and so that a consent form for surgery is completed in advance and not on the day of surgery. If a patient is traveling a long distance however, this second consultation can be omitted and instead queries can be addressed by email and a copy of the consent form sent in advance so that this can be checked by you. For patients who are insured, a formal visual field record and photographs are often required by the insurance company. These can be arranged with Becky, the optometrist of Eye2C Optometry at the Face & Eye clinic in Manchester. Alternatively the visual fields can be organized by your own optometrist. 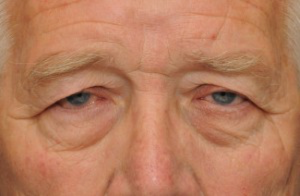 What are the possible complications of ptosis surgery? What happens after blepharoptosis surgery? After blepharoptosis surgery, the eyes are initially covered with pressure dressings for approximately half an hour to reduce postoperative swelling and the wounds are treated with antibiotic ointment. The dressings are then removed and replaced with cool packs. Activity is restricted for 2 weeks to prevent bleeding. For some patients, a stitch is passed through the lower eyelid which is used then pulled up to protect the eye under a dressing. The stitch is taped to the forehead and is usually removed the next day. This is referred to as a ‘Frost’ stitch. You will be asked to clean the eyelids very gently using clean cotton wool and Normasol (sterile saline) or cooled boiled water and repeat the application of antibiotic ointment (usually Chloramphenicol or Soframycin) to the wounds 3 times a day for 2 weeks. The sutures used for a levator aponeurosis advancement are dissolvable but are usually removed in clinic after 2 weeks. The sutures used for a Muller’s muscle resection are removed in clinic after approximately 3-7 days depending on the height of the lid in the early postoperative period. The scars gradually fade to fine white marks within a few months. (When the surgery has been performed via a conjunctival incision on the inside of the upper eyelid there are no visible scars). Those in the upper eyelid are hidden within the skin crease unless an additional skin incision is required to remove a “dog-ear” of excess skin just below the tail of the eyebrow. You will need to use frequent artificial tears for the first 2-3 weeks following surgery. It is preferable to use preservative free drops. These will be prescribed for you e.g. Xailin gel and Xailin Night ointment at bedtime. It is often recommended that you use Xailin Night ointment to the eyes 2 hourly for the first 48 hours after surgery following any upper lid surgery but note that this will cause blurring of vision. (You should not drive for the first few days after surgery). These medications can be purchased from my clinic Face & Eye . You are advised to sleep with the head raised approximately 20-30 degrees. It may be preferable to raise the head of the bed if possible. Contact lenses should not usually be worn for a few weeks following this type of surgery but this will depend on the type of lenses you wear and your postoperative progress. To learn more about Droopy Eyelid (Ptosis) Surgery, please contact us at today to schedule an appointment.